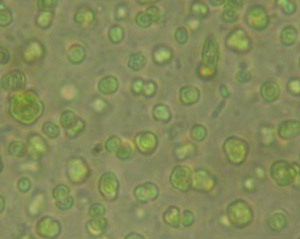 Chlorella is a single-celled microalgae which grows naturally in freshwater bodies across the globe. It is a type of phytoplankton — free floating aquatic plants which create their own energy from sunlight using the green photosynthetic pigment chlorophyll. The name chlorella comes from the Greek word “chloros” meaning greenish-yellow, and chlorella colonies can turn bodies of water a vibrant green colour due to their high chlorophyll content. A litre of chlorella suspension can contain over 20 billion individual cells, with each spherical chlorella cell only about 10мm across, and chlorella reproduces quickly through asexual division creating between 2 and 16 new ‘daughter’ cells every 16-20 hours. Chlorella is an ancient species which first evolved around 2 billion years ago, but was only identified in the 1800s by a Dutch scientist. Much research was conducted in the early 1900s into chlorella’s potential as a readily available source of nutrition as it grows quickly, assimilating energy at a faster rate than other terrestrial plant crops. It is now grown and harvested commercially in countries across the world with a suitably warm climate and consistent sunlight, as it requires temperatures between 20-25°C and constant sunlight to grow sufficiently for cell division to occur. Chlorella is high in protein as well as the photosynthetic pigment chlorophyll, and the yellow plant pigments carotenoids, and since the 40’s research into its potential health benefits has led to its increased cultivation across the globe. 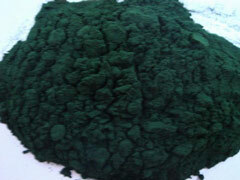 Our chlorella is grown and harvested on a small island in the South China sea. The freshwater ponds are filled with water extracted from deep below the ground, which is carefully filtered before use to ensure it is completely pure. No chemical pesticides or herbicides are used in the growth of our organic chlorella, and it is allowed to grow outside under natural sunlight whilst being gently mixed to ensure an even distribution of the newly generated chlorella cells as it rapidly reproduces. The climate in this area is ideal for cultivating chlorella, with upwards of 20,000 hours of sunshine each year and consistently high temperatures. 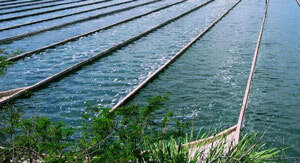 The surrounding area is made up of natural forest, with no risk of contamination from agricultural runoff. A culture of pure chlorella is added to the water in the growth ponds, and this begins to reproduce immediately, reaching a concentration where it can be harvested within around 6 weeks. After this the newly generated chlorella can be harvested weekly, and is sieved off the surface of the water using fine mesh screens which capture the small individual chlorella cells. The chlorella is carefully washed by hand then rapidly dried, preserving the maximum amount of nutrients. This dry powder is then milled to break the insoluble chlorella cell walls, which cannot be broken down by the human gut due to the tough cellulose fibres which most animals do not possess the enzymes to digest. The milling process produces the broken cell wall variant of chlorella, which makes the nutrients found inside the chlorella cell more accessible without losing any of the nutritional benefits. Chlorella is a great source of protein — over 50% of its dry weight — as well as conferring many health benefits due to its high content of chlorophyll and other vitamins and nutrients. There are on average 2500mg of chlorophyll in 100g of our organic chlorella powder. This plant molecule is essential for photosynthesis, absorbing energy from sunlight and using it to convert carbon dioxide from the atmosphere into glucose energy. The high levels of chlorophyll in chlorella have led to it becoming a popular component of detoxing regimes, as it is believed that chlorella can bind to heavy metals within the intestinal tract, allowing them to be safely excreted from the body. Chlorella also contains the carotenoid polymer sporopollenin within its cell walls, which studies suggest is able to absorb toxins and helps chlorella to remove further poisonous elements from the body. Our organic chlorella powder also contains 2g of chlorella growth factor per 100g; the compound reputed to be responsible for chlorella’s ability to reproduce at such a high rate. CGF is reported to increase the rate of regeneration of new cells when ingested, and may help to increase cell rejuvenation and repair. Chlorella is also a source of the minerals zinc and iron, needed for a healthy immune system and making new red blood cells capable of carrying oxygen around the body, and contains the antioxidant vitamins C and E, which can reduce the production of cell damaging free radicals. Chlorella powder also provides the B vitamins B1, B2, B6 and B12 which contribute to maintaining a healthy immune system. Mix organic chlorella powder into a glass of orange juice or blend it into smoothies to benefit from the natural detoxing effects whilst giving your diet an added vitamin boost from this ancient algae.